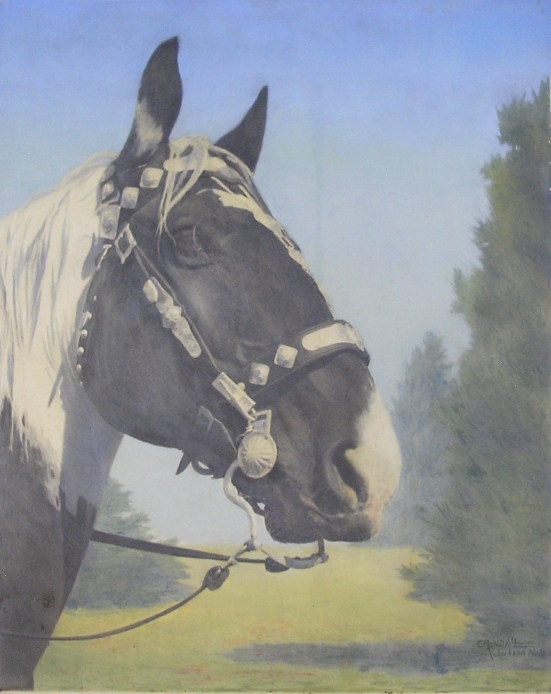 This is a large hand painted photograph of one of the Huyler's famous black and white paint horses, possibly one known as Silver King, who also appears in other Crandall photographs. The Bear Paw Ranch won many awards for their paint horses - Jack Huyler still has the ribbons in his barn, although the early Jackson Hole dude ranch is no longer extant in Grand Teton Park. This photograph is one of Crandall's low-resolution images that was then hand painted with oil paints. His photos are considered the icons of the dude ranch era. This one comes from the family. Size: 27.5" wide by 32" high matted and framed.